The upcoming reboot of Marvel’s Fantastic Four gets set to break dimensional barriers in less than a month. However, with the public debut of the new trailer shown to San Diego Comic-Con crowds this past weekend, we have finally been given a substantive glimpse of the team’s traditional antagonist, Doctor Doom. Additionally, Fox unveiled yet another new trailer today. Check out both of the new clips below. 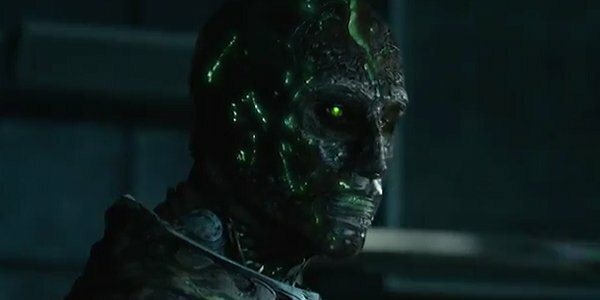 With film classifying itself as a "contemporary re-imagining," the new official Fantastic Four trailer immediately sets out to live up to that billing by digging deeper into the character development. This video sets quite the tone of curiosity by starting with a glimpse of a prodigious young Reed Richards, whose scientific and engineering aspirations seem to be the destructive bane of both his school life and his blue collar parents’ property. Clearly a brilliant visionary, even in grade school, a pattern seems to be set for his life, which will eventually see an adult Reed make a stunning breakthrough with implications far greater than fried fuses. Further emphasizing this tone, the voice-over from Reg E. Cathey’s Franklin Storm discusses our duty as human beings to push forward into the unknown. Yet, the accidental discovery that will transform the team into the super-powered pounders of evil also taps into a Pandora's Box-like pocket of power. On one hand, it creates the heroic team that the government exploits. On the other, it creates the metal-covered malevolence of Toby Kebbell’s updated take on the A-list Marvel baddie, Doctor Doom. While the trailer stops short of details regarding his origin and motivations, it’s clear that his beef with the team and stretchy Reed Richards (Miles Teller) is a personal one that will yield some brutal, knock-down drag-out destruction. Much like the way that Julian McMahon’s version of Doctor Doom was portrayed in the 2005 Fantastic Four, and its 2007 sequel, Kebbell’s version also deviates from the character’s traditional comic book rendition and seems to have some kind of kinship with the team. Like those films, he is also portrayed as more innately powerful than any one of the foursome, making the collective energies of the team necessary for his defeat. Based on what we’re seeing in the clip, with a pre-transformation version of Jamie Bell’s Ben Grimm overlooking a fully transformed Doom who is strapped to a bed, it could be the case that Doom is the proverbial patient zero in the still-vague inter-dimensional phenomenon that will ultimately transform the team. That, however, is still unclear. Fox also surprised fans today with a brand new trailer that seems to complement the wondrous tone of the Comic-Con clip. Beside giving us a little more footage of Doctor Doom, this trailer shows more of young Reed Richards and his mysterious playmate, transitioning to a focus on the critical ingredient of the new Fantastic Four's group dynamic. You can give that clip a glimpse in the video below. Certainly, Fantastic Four will have quite a lot to overcome being a Marvel Comics property not connected to either Marvel Studio’s Avengers continuity or (as far as we know,) Fox’s own mixed-up X-Men mythos. Plus, for better or worse, it recently abandoned its 3D release. However, the new trailer does demonstrate that the film sports enough brute strength to initiate clobberin’ time for the box office competition when it arrives at theaters on August 7.